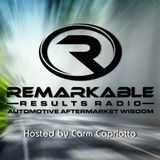 Automotive Aftermarket Success Stories from the industries service professionals, trainers, coaches, technicians and thought leaders. RR 423: Shop Talk 10 – Sold My Business – What’s Next? THA 113: Taking Care of Your Most Valuable Asset – YOU! Quieres escuchar este show desde el móvil? Descarga el app ahora en tu dispositivo.